We’d love your help. 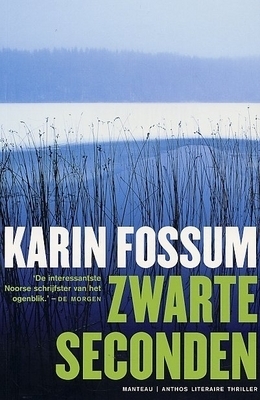 Let us know what’s wrong with this preview of Zwarte seconden by Karin Fossum. To ask other readers questions about Zwarte seconden, please sign up. Does anyone else think Emil Johannes is autistic? Not based on the premise that he does not speak. Black Seconds, is the sixth instalment in Karin Fossum’s outstanding series featuring Inspector Konrad Sejer and Jacob Skarre and begins with every parent’s worst nightmare: a missing child. Released in Norway in 2002 and only available in English translation in 2007, this novel is a police procedural, although its immense power stems from some breathtaking psychological insights and the compassion of the investigators. The crime itself is very simple, and sadly an everyday occurrence, yet Fossu Black Seconds, is the sixth instalment in Karin Fossum’s outstanding series featuring Inspector Konrad Sejer and Jacob Skarre and begins with every parent’s worst nightmare: a missing child. Released in Norway in 2002 and only available in English translation in 2007, this novel is a police procedural, although its immense power stems from some breathtaking psychological insights and the compassion of the investigators. The crime itself is very simple, and sadly an everyday occurrence, yet Fossum’s sensitively observed and painstakingly precise recounting is heartfelt and truly compelling. The unhurried and measured pace of the novel means that Black Seconds will not appeal to readers who demand pulse-pounding action, especially since the perpetrator is fairly apparent from the early pages. In the novels of Karin Fossum, the crimes are never open and shut cases and assigning blame is not the sole focus. Her realistic characters are very much seen as a product of their circumstances, and empathetic and assured Inspector Konrad Sejer is a man who understands the futility of attempting to examine an event in isolation. For life is never so easy to unravel and Inspector Sejer recognises that sensitivity is needed as he gently probes and gives the involved parties an opportunity to speak, whilst never judging. Readily sympathising with predicaments that might not have been instigated by any malevolent intent and yet had hideously unfortunate repercussions, Inspector Konrad Sejer fosters a rapport with almost all of those he encounters in the course of his work. Black Seconds focuses on the disappearance of angelic looking, cheerful and rather precocious nine-year-old, Ida Joner, as she counts down the days until her tenth birthday. She sets off on her distinctive yellow bicycle to buy a magazine and chewing gum and mother, Helga, watches her from the window as she turns left on route to town and Laila’s Kiosk. Ida’s mother, forty-nine-year-old Helga, is an nervous and overprotective parent and her beautiful daughter means everything to her. Helga’s anxiety at the void created by Ida leaving the house immediately sees the first prickles of fear settling in the pit of her stomach and long after Ida should have returned home she clings to a fragile hope. After pacing back and forth to the window, making plea bargains with God and promising to allow Ida the pet she craves if only she returns home safe and well, Helga finally has to acknowledge that Ida neither arrived at Laila’s Kiosk or has made it home safely. Calling first her sister, Ruth Rix, five-years her junior and a mother of two, and subsequently alerting the police, Fossum captures the harrowing search for Ida from the motivations of those that turn out for the search parties to the sudden implosion of a mother's world. As the search labours onwards and days pass without any sign of Ida, Ruth is relieved of her obligations to watch over Helga by Ida’s father, Anders, and returns to her home and her eighteen-year-old son, Tom Erik (Tomme) and twelve-year-old daughter, Marion. However, Ruth is distracted by her son’s low mood, his reluctance to talk about Ida and his car prang on the very same night as her disappearance. The news that Willy Oterhals, an older boy with a disreputable past and suspected links to drug dealing intends to aid the repair of the dented and scratched Opel does nothing to stem her feeling of disquiet. Simultaneously, Fossum also introduces mentally handicapped Emil Johannes Mork, a fifty-two-year-old man whose gruff appearance, strange three-wheeled vehicle and stubborn refusal to engage in conversation beyond saying ‘no’ is well-known locally. Despite living on his own with his African grey parrot, Henry, Emil is marshalled by his seventy-three-year-old mother, Elsa, who cleans his home and handles matters that she feels are beyond his comprehension. As Sejer is losing hope of successful resolution, the discovery of Ida’s body dressed in a beautiful nightie and ensconced in a white duvet provides two vital clues that point the way forward. As Inspector Konrad Sejer refuses to automatically rush to assign the blame at the door of Emil, a man practically incapable of conveying his side of the story, his diligent observation of a community in shock reveals that there could be more to the situation than meets the eye. Inspector Sejer is a earnest man with a lifetime of detective work behind him and he realises that rather than frightening or bullying suspects, there is a lot more to be said for reassuring and patient exchanges which can create a bond. Most importantly of all, he strives to understand the underlying reasons for a crime by placing himself in the situation of all the involved parties. His comprehension of how people can often act on impulse and subsequently be left in the awkward position of justifying their actions retrospectively is behind his humane approach to both Emil Johannes, his mother, Elsa, and Tomme Rix. Fossum’s powerful psychological character study show the burdens of guilt, the toll they can take on a person and the implications of a future bound in lies. For sensitive and thought-provoking police procedurals with an emphasis on the psychological insights, Fossum is in a class of her own! Black Seconds is another marvellous example of both her eloquence, the benefits of delving deeper into the origins of a realistic crime and the thought processes of a detective intent on understanding. Despite learning a great deal about Ida, readers never actually meet her but her presence looms over every moment of this heartbreaking and simply exquisite story. Karin Fossum knows well the edginess and anticipation her readers feel as they plunge into extraordinary crime. She drives them to continue reading. How and why did the event happen? Who did it? What are the inescapable feelings of the family and the accused? Inspector Konrad Sejer continues to thrill me with his probing questions. Mild and assuming, he puts a subject at ease. He waits for them to fill the silence. Then, he pounces on their statements. Not proud, but correct and professional. He' Karin Fossum knows well the edginess and anticipation her readers feel as they plunge into extraordinary crime. She drives them to continue reading. How and why did the event happen? Who did it? What are the inescapable feelings of the family and the accused? He's moralistic and will always tell the subject what they did was wrong. Not satisfied with a conviction, he wants only the truth. If not to settle the case, but to complete his searching curiosity. Something terribly wrong was done and there must be an answer. Not all crimes are driven by malice and some of the best mysteries are not whodunnits but rather the how and why. This book crosses the 'T' on that. Inspecter Sejer with his calm and refined pursuit for the truth, than the criminal, is definitely one of the most charming fictional detectives. Ida Joner, a young girl goes missing along with her bicycle, under the watchful eyes of her mother. Inspecter Sejjer knows when a young girl is kidnapped, the girl will turn up, dead or alive, very soon. How Not all crimes are driven by malice and some of the best mysteries are not whodunnits but rather the how and why. This book crosses the 'T' on that. Inspecter Sejer with his calm and refined pursuit for the truth, than the criminal, is definitely one of the most charming fictional detectives. Ida Joner, a young girl goes missing along with her bicycle, under the watchful eyes of her mother. Inspecter Sejjer knows when a young girl is kidnapped, the girl will turn up, dead or alive, very soon. However, when she does not turn up, despite a volunteer search it becomes a puzzle. The fact that you get to see the plot into the who and what does not still solve the puzzle and therein lies the book's charm. The tension in the initial few pages after the kid goes missing is affecting and is a credit to the author. There were some parts which I felt were not linked back once the plot started developing, but then I am just being picky. Loved the family/accused interrogations done by Sejer and Skarr - which seemed to have a basic care in the tone and non threatening. A clean police work that is equal parts methodical and clever. I had begun reading mysteries in about 1970, but it was only in 1998, when I began rating them for my own amusement (being a computational mathematician I love numbers). I did not rate all of the mysteries that I read, but I did most of them. A few days ago I looked my ratings up, and found out that among about 1300 mysteries I have rated there are just two that have received the highest rating of 9.5 out of 10, in my scale. One of them is Karin Fossum's novel "Black Seconds" (published in 2002 I had begun reading mysteries in about 1970, but it was only in 1998, when I began rating them for my own amusement (being a computational mathematician I love numbers). I did not rate all of the mysteries that I read, but I did most of them. A few days ago I looked my ratings up, and found out that among about 1300 mysteries I have rated there are just two that have received the highest rating of 9.5 out of 10, in my scale. One of them is Karin Fossum's novel "Black Seconds" (published in 2002 in Norway), and the other is "The Chill" (1964) by Ross Macdonald. I read "Black Seconds" for the first time in 2009, when it was published in the U.S. and then copied my enthusiastic review from Amazon.com to Goodreads. Being a skeptic, I believe that people are constantly wrong and that I am wrong more often than others, so I decided yesterday to read the novel again to check the extraordinarily high rating. I stubbornly stand by my opinion; this is probably the best mystery book I have read in my life. Most of you who have read it will certainly disagree with me. Yes, it is pretty good, well written, with realistic characters, but best mystery ever? Come on, don't be silly. Well, I will try to justify my outrageous claim. I have read nine books by Ms. Fossum. She is the absolute master of psychological observation. The mother's terror when her daughter does not come home at expected time is described with clinical accuracy. The overpowering fear, the senseless seeking for reasons for hope, the deal making with God, with fate. Ida, the girl who disappears, has always dreamed about a pet. Her birthday is coming, and the mother said "no". Now, she promises to buy all sorts of pets, when Ida comes back. Can you imagine the pain of an almost 50-year-old, lonely woman, losing a beautiful, well-behaved 10-year old daughter who was the only thing for which her life was worth living? Now she is gone, forever. I believe most parents went through the hell of fear of losing a child when he or she is half an hour late. But in almost all cases the kids come back late. The most beautiful, absolutely outstanding feature of Ms. Fossum's book is her compassion toward people. Weakness is the essence of the human nature; we are stupid, vain, self-centered, greedy for stuff and for power, insensitive to others' pain. Yet in "Black Seconds" the only person who is presented in negative light is not guilty of Ida's disappearance. All characters in the novel are real people, they are not just the templates of the "murderers" and the "victims" or agents of the bad and the good as happens in most crime books. The only exception is, of course, Inspector Sejer. Police inspectors are human like all of us, meaning they exhibit all the negative traits of human nature. Mr. Sejer has too few of those, so maybe that is why I cannot assign the novel the rating of 10/10. Furthermore, Ms. Fossum's novel, despite in fact being a police procedural, wonderfully slow, muted, and quiet one, is indeed a mystery. I mean we kind of know "who did it" from rather early in the text, and we are right. But not just quite right. I am unable to write any more on that topic, in order not to spoil the mystery. This "just not quite" is an extremely strong asset of "Black Seconds", if one reads mysteries for the "mystery". I do not care much about the "mystery factor", but here it is strongly present. And the method used by Inspector Sejer to finally understand what happened is refreshingly clever. Finally, don't miss the last paragraph of the novel! I have been reading mystery novels for over forty years, at a pace of about a hundred books a year. Karin Fossum's "Black Seconds" is her third book I read, and to me it is the best. I began with "When the Devil Holds the Candle" and I liked it. I loved "Don't Look Back", especially the masterful way the author teases the reader at the beginning, by way of a "false start". I found "Black Seconds" among the very best books I have ever read. Yes, it is a mystery, and it sort of keeps you guessing to the end, but that is not important at all. The psychological portraits of the characters are drawn so well that I felt I had known these people for years. The gentle "interrogations" towards the end of the book are reminiscent of Dostoyevski's "Crime and Punishment". There is not much action, but there is so much truth about people instead. Ms. Fossum writes extremely well, and the translator did a splendid job in managing not to spoil the dry, to-the-point style. A piece of real literature. Още една чудесна скандинавска книга! Напоследък съм много чувствителна , когато чета или гледам филми за изчезнали малки деца и затова тази книга истински ме разтърси и я съ-преживях. Не си спомням откога не съм чувствала истинска жал и съчувствие към някой герой, както това се случи в тази книга с един от героите - умствено изостанал мъж. Типичното за скандинавските романи - социалният елемент - не липсваше и тук. Изобщо, само суперлативи мога Още една чудесна скандинавска книга! Изобщо, само суперлативи мога да кажа за тази книга и да я препоръчам на всички любители на жанра! До тук с положителните неща! Сега искам да сложа една ОГРОМНА черна точна на изд.ЕМАС и по-точно на коректорите им!!! Необяснимо ЗАЩО и необяснимо КАК към 240 стр. леонбергерът на главния инспектор Сайер от Колберг става Колбасар?!?!! А героинята Елса Морк - Елса Корк. Ако за кучето имам някакво предположение - куче-любител на колбаси или коректор по време на пости, то за Елса нямам обяснение. Това е и причината да сложа 4* на книгата, която сама по себе си си е за пълни 5*!! This is a wonderful series. I've read two others but didn't realize that ALL of Fossum's books are now available on Kindle through my local library. Wow, I am going to start from the beginning and read them all. Ida, a beautiful, precocious, daring only child, turns up missing. Two threads are developed, one of which leads to the killer, in an unpredictable way. It may seem strange to comment on the COLOR of a police procedural, but the use of color in this book is striking and significant - a y This is a wonderful series. I've read two others but didn't realize that ALL of Fossum's books are now available on Kindle through my local library. Wow, I am going to start from the beginning and read them all. Ida, a beautiful, precocious, daring only child, turns up missing. Two threads are developed, one of which leads to the killer, in an unpredictable way. It may seem strange to comment on the COLOR of a police procedural, but the use of color in this book is striking and significant - a yellow bicycle, a red feather from an African grey parrot. I think these colors stand out because the prevailing colors of Norway in these books are shades of black-white-grey. Ida is a colorful character and these colors are associated with her, whereas those surrounding her are less vivid. Interesting in their own way, but less vivid. We never actually SEE or hear Ida speak, we see her only through the eyes of others. Inspector Sejer is incredibly patient with those he interviews, and the way he relates to the near-autistic 52-year-old man is creative and productive. Fossum's depiction of this character is masterful and quite moving - the scene of his struggle to speak, which he can only do when near a waterfall that drowns out his sound, is unforgettable. A young girl goes missing and Inspector Sejer is assigned the case. Definitely not a high octane thriller but a well written, though with an understated style, tale of suspense set in Norway. I plan on giving all of my Karin Fossum reviews the same statement because I don't even want the hint of a spoiler on this woman's fantastic work. Fossum's writing gave me my love of Scandanavian mystery writers and I seek those writings out. Hands down,though, Fossum's work is the best I have come across so far. In the past I have read many of Fossum’s books, both her standalone titles and those that are part of her Inspector Sejer series, and she has an acutely percepti The disappearance of a young child and the ensuing police hunt is a well-worn trope in crime fiction. I’ve read so many crime tales of this nature I no longer bother with them, but I decided to make an exception for Karin Fossum’s Black Seconds, because she’s an author I can trust to cover such a crime in a compassionate, thoughtful way. Her novels usually tackle the psychological impacts on both the victim’s family and the perpetrator, highlighting how criminal acts can never be seen in isolation and how they cast long shadows on a wide circle of people and the communities they inhabit. These themes are also present in Black Seconds . It's wonderful how kind the detectives are. But Fossum seems to have forgotten that police procedurals have at their core a mystery. This is not so much a who-done-it as a when-will-the-police-realize-it. To date I have enjoyed the Inspector Sejer series. Unfortunately the plot of this one, involving the disappearance of of young girl, was very similar to a previous story and very transparent. As soon as Tomme and Willy started to work on the car it was evident what had happened. Quite believable characters but the books do portrait Norway as dark and the people dour. Creepy is an understatement when talking about Karin Fossum's detective series featuring Inspector Konrad Sejer and his colleague Jacob Skarre. In "Black Seconds," readers get a glimpse into a dark world not too many authors can create as powerful and troubling as Fossum. From the beginning of the series in "Don't Look Back" until now in "Black Seconds," Fossum knows how to create a believable and realistic sketch of her characters and their aging lives. As evidence, Konrad Sejer is not the same Creepy is an understatement when talking about Karin Fossum's detective series featuring Inspector Konrad Sejer and his colleague Jacob Skarre. In "Black Seconds," readers get a glimpse into a dark world not too many authors can create as powerful and troubling as Fossum. From the beginning of the series in "Don't Look Back" until now in "Black Seconds," Fossum knows how to create a believable and realistic sketch of her characters and their aging lives. As evidence, Konrad Sejer is not the same man we have seen in "Don't Look Back" or even in "The Indian Bride." He is more vulnerable, in private and in public life. Behind closed doors, we see his beloved dog Kollberg struggle with the aging process. He can hardly walk anymore, or find his cozy surroundings comfortable. Late one night, while Sejer comes home from work, he sits in his favorite chair by the window and stares across the room at his dog, who walks in circles a few times until he collapses on the floor. His hind legs hit the floor first, then his paws, and finally his heavy head falls in front of him. It is too difficult for Sejer to look his dog in the eyes. At work, Sejer deals with a case that he finds most puzzling to date. As he interviews Emil Mork and his mother, Elsa, Sejer discovers how rewarding and debilitating his line of work really is. At one point in the novel when Sejer questions Elsa about her son's anger management problems, Sejer is seen as weak and scared for the first time. He sees Kollberg in her story, I think, and takes her confession personally. The more I read Karin Fossom, the more I am appreciating what she does with her writing. Wonderful psychological insight into even the smallest characters, through the protagonist's eyes of Konrad Sejer--a detective with old-fashioned sensibilities. A young girl goes missing. Everyone in the small town assumes she's dead, and how it affects the families and inhabitants, even down to their pets. Desde el tercer capítulo sabía lo que había pasado,todo!!! Totalmente defraudada con esta novela,más cuando Fossum es de mis autores nórdicos favoritos. Leed a Karin Fossum,pero no este título. A common problem in mystery books seems to be that the true killer comes out of nowhere. Particularly in Agatha Christie books, red herrings are scattered all over the place, and the real killer always seems to be the most implausible person. Black Seconds, however, went too far in the other direction, in my opinion. The first half of the book is concerned with Ida, an almost-ten-year-old girl who suddenly disappears one day. The second half deals with what happens after they find her. I really en A common problem in mystery books seems to be that the true killer comes out of nowhere. Particularly in Agatha Christie books, red herrings are scattered all over the place, and the real killer always seems to be the most implausible person. Black Seconds, however, went too far in the other direction, in my opinion. I really enjoyed (though perhaps that's not the right word to use) the first part. Ida is just a normal, vivacious young girl, and the details of how her mother, father, her relatives, her Norwegian town, and the police deal with her disappearance. It seemed heartrendingly real to me, their reactions, their fears, and their helplessness because they didn't have a body. And despite how unlikely it is for any missing child to turn up alive and well after a day, I wanted her to, for this story to have a happy ending. Enough with the comparisons to Ruth Rendell already! (Every review or article or blurb about Fossum in the ENglish-speaking world goes there.) Fossum has the same psychological complexity, the same interest in psychological aberrance, but a lot more compassion than Rendell. True, her detective, Sejer, is a bit too noble--how come fictional detectives are either perfect (a la Dalgleish, Poirot, Holmes) or shambling wrecks (a la Rebus, Wallander, Erlendur)?--but the book does a terrific job at seem Enough with the comparisons to Ruth Rendell already! (Every review or article or blurb about Fossum in the ENglish-speaking world goes there.) Fossum has the same psychological complexity, the same interest in psychological aberrance, but a lot more compassion than Rendell. Another good read by ms Fossum with a missing child as the focus of the crime but with the twists and turns that accompany her stories. Once again detective Sejer solves the crime and this time we get a better look at him and a good glimpse of his psyche. I did enjoy this one. 3.5/5 This was my 3rd book by the author and finally this one was a good mystery worth a read. A 10-year old girl disappears and again there is somebody with a mental illness in the picture like "Dont Look Back". But this time the girl doesnt return. Inspector Sejer and his colleague Skarre diligently investigate and finally reach the conclusion by some thoughtful questioning and police work. While the readers can guess most of the "who","what" and "how" early, watching the policemen reach there 3.5/5 This was my 3rd book by the author and finally this one was a good mystery worth a read. A 10-year old girl disappears and again there is somebody with a mental illness in the picture like "Dont Look Back". But this time the girl doesnt return. Inspector Sejer and his colleague Skarre diligently investigate and finally reach the conclusion by some thoughtful questioning and police work. While the readers can guess most of the "who","what" and "how" early, watching the policemen reach there was still interesting. The policemen are likeable characters and in all the Fossum books, the perpetrators are not hardened criminals or evil. She brings out the humanity of the perpetrator very well and you almost feel sorry for the circumstances that led to the crime. In that sense, the books are realistic and relatable. I don't think I got anything out of reading this book. Perhaps it was the translation or it could have just been Fossum's style, but the writing didn't work for me. It felt awkward and stilted throughout the book. None of the characters felt like real people, a lot of the time their emotions seemed painted on rather than genuine, and their behavior rarely seemed to fit the circumstances. Plus it was painfully predictable. I realized the ending on page six. Literally page six. I kept hoping there I don't think I got anything out of reading this book. Perhaps it was the translation or it could have just been Fossum's style, but the writing didn't work for me. It felt awkward and stilted throughout the book. None of the characters felt like real people, a lot of the time their emotions seemed painted on rather than genuine, and their behavior rarely seemed to fit the circumstances. Plus it was painfully predictable. I realized the ending on page six. Literally page six. I kept hoping there was going to be a different twist or something more, but it was literally just the incredibly basic story I predicted. And it seemed ridiculous that none of the cops realized it sooner. I like Karin Fossum's Inspector Sejer series but I find that the plots often are very much like all of those that came before them...especially if they involve abductions. If you've read very many of these you will find that you can figure out the "what" and the "who" fairly early on. What the series has going very much in it's favor is a high degree of atmosphere in the stories and a very strong character in Inspector Sejer. This is a good series for anyone that likes a good "who done it." Ufattelig forutsigbar, visste så og si med en gang nøyaktig hva som hadde skjedd, men likevel er det noe med karakterene og måten det er skrevet på som gjorde at jeg ikke klarte å slutte å lese. Ida Joner is a sweet girl, adored by her mother Helga. She loves animals, and is looking forward to her tenth birthday. One day she rides out on her yellow bike to buy some sweets. When she fails to return 35 minutes after she should have, Helga starts to worry. She phones around, but there is no word, and eventually she calls the police. Still no news the following day, a local search is organised, with hundreds of local volunteers. However, nothing comes of it. Ida Joner and her yellow bicycle Ida Joner is a sweet girl, adored by her mother Helga. She loves animals, and is looking forward to her tenth birthday. One day she rides out on her yellow bike to buy some sweets. When she fails to return 35 minutes after she should have, Helga starts to worry. She phones around, but there is no word, and eventually she calls the police. Still no news the following day, a local search is organised, with hundreds of local volunteers. However, nothing comes of it. Ida Joner and her yellow bicycle seem to have vanished into thin air. Fossum seems to write two different kinds of novels: sensitive procedurals focusing on simple, everyday-crimes crimes (“Calling Out For You”), and psychological thrillers based on original and twisted conceits (“When the Devil Holds the Candle”). “Black Seconds” is of the former type. It deals with a simple, unflashy crime, one that could (and does) happen anywhere. This sad simplicity adds to the strange power of her novels, with their achingly realistic crimes, and their achingly realistic victims, their relatives and neighbours. If there is one thing that makes Fossum stand out most it is her compassion for every character: victim, policeman, even murderer. It is the emotional sensitivity of her prose, the immense power she has of evoking empathy for the sorriest of people. Her victims are painfully normal. Her killers are often social outcasts on whom suspicion naturally falls and who are mentally less-well off (a common feature in her novels). Perhaps this method of revealing society's simplistic reactions is overused in her novels, but it is effective, and usually quite creepy. She has such a natural style and her emotional frankness and simplicity can sometimes be hard to read. Another common thread in her novels is crimes which arise by accident, unfortunate confluences of events. Her criminals are often as much victims of circumstance as anyone else; they are often good and normal but for that one act that distinguishes them from other people: they are, for whatever reason, responsible for killing someone. There's little malice in the crimes of “Black Seconds”, which makes its events hard to know what to do with, and certainly hard to condemn. This seems to me to be a more realistic portrayal of how real crimes occur, and a more thought-provoking one. Chance puts human failings and behaviour on show in all their sad glory. What's really clever is the way the second plot revolves around the first. In fact, it's the second plot (about a teenager who crashes his car) that is the most interesting part of the novel. It throws up all kinds of questions about ideal and actual morality. Nothing is clear cut (another theme of Fossum's). The way these two strands are pulled together is beautifully done in the author's unpretentious but stylish hand. In a way, not much happens, but the way it happens is absolutely compelling. In just a few well-chosen words, Karin Fossum creates a world you care about, people you can see and feel, and an atmosphere you can touch. I don't know anybody who does this kind of thing better. “Black Seconds” is a powerful and impressive novel. Sensitive and probing, it delves deeply into the minds and lives of its characters. Fossum holds back as much as possible about the philosophical, charismatic but enigmatic Inspector Konrad Sejer, so he retains that air of mystery about him, and he carries the book well to its inevitable conclusion, with it's bitter final punch. Inspector Sejer is the reassuring anchor-man and his junior, Jacob Skarre is the device through which we learn how clever Sejer is. It all works beautifully. “Black Seconds” is not quite as good as the exemplary “Calling Out For You”, but it mirrors many of that novels great strengths, and is another volume in an excellent body of work. I've read most of Karen Fossum's novels and have thoroughly enjoyed them all. This one is a bit different in that I had a pretty good idea of what happened long before the end of the book. However, it's still utterly gripping. The story is very well written, there is some good, sparse and evocative description and character building that doesn't get in the way of the story. There is also little melodrama, and nothing is OTT. It all feels very realistic, without trying to dredge emotions out of you. Tick-tock goes the clock as the black seconds pass. Ida Joner; a pure, animal-loving girl from Norway. She's young and excited. After all it's her birthday in a week and she's finally going to turn 10 years old. One day, she goes off to buy a magazine and some candy. She takes her bike, she straps on her helmet, and she's off. Her mother waits at home. But after a while, little Ida doesn't return. The police are called and the incident is reported. They search but to no avail. She's vanished int Tick-tock goes the clock as the black seconds pass. Ida Joner; a pure, animal-loving girl from Norway. She's young and excited. After all it's her birthday in a week and she's finally going to turn 10 years old. One day, she goes off to buy a magazine and some candy. She takes her bike, she straps on her helmet, and she's off. Her mother waits at home. But after a while, little Ida doesn't return. The police are called and the incident is reported. They search but to no avail. She's vanished into thin air. In this Scandinavian mystery book, Karin Fossum write of an inspector. Konrad Sejer is his name and solving crimes is his game. As soon as Ida's mom, Helen, has her world turned upside down, Konrad is on the case. His determination pushes him forward when others have lost hope. In a story of twists and turns and "who did what", everybody is a suspect. The answer to this real life puzzle seems almost unbelievable but in the end all the leads point to one person. A character that I identified with was Emil. He's shown as a character who's strange, doesn't talk much, and he's shown as a character who's distant. I feel like we share those traits. Usually, I'm a quiet person. I don't talk often, and when I do it's not a lot. People that don't know me might see my actions as weird and are misunderstood. The same goes for Emil. The message that the author is trying to convey is that we should expect the unexpected. Although this phrase might be a bit overused, I feel that it does fit the story. Nobody expected Ida to disappear. She was too kind and sweet. She was an innocent little girl. When she was found dead this was an extra punch in the gut. Also, it's a plot twist when it's revealed who had killed Ida. At first, it seemed that Emil was the killer. In the story, chapters about him are cut short and leave the reader trying to fill in the blank by imagining that Emil is the guilty one. Little does the reader know that their guess is wrong. The author purposefully leaves out Tomme until the very end. Throughout the story, the more that is shown of Tomme the more suspicious he appears. On the other hand, the more that is shown of Emil the more innocent he's proven to be. In the end, it's revealed that Tomme is the murderer. He hit Ida with his car and left her with internal injuries that eventually cause her death. And Emil is revealed to be a caring person who takes Ida in and ends up being framed. A young girl called Ida disappears. She had gone to a local shop on her distinctive yellow bicycle. It soon becomes clear that there are two main suspects, Tomme, a teenage relative, and Emil, over fifty now, whose vocabulary is restricted to the word ‘no’, though his ability to think is greater than that might suggest. Tomme has just bashed his car and has recruited an older friend, Willy, to fix it for him. Perhaps Tomme ran into Ida and Willy is removing any evidence? When asked, Tomme can ex A young girl called Ida disappears. She had gone to a local shop on her distinctive yellow bicycle. It soon becomes clear that there are two main suspects, Tomme, a teenage relative, and Emil, over fifty now, whose vocabulary is restricted to the word ‘no’, though his ability to think is greater than that might suggest. Tomme has just bashed his car and has recruited an older friend, Willy, to fix it for him. Perhaps Tomme ran into Ida and Willy is removing any evidence? When asked, Tomme can explain how and where his accident took place, and the police find physical evidence at the scene which appears to support his story. Emil, on the other hand, is often to be seen out and about on his three-wheeled vehicle. Could it have been him? Asking him is not the easiest way to find out. And then Willy, known to the police for drug dealing, disappears on a return ferry trip from Copenhagen with Tomme. There are two police officers on the case, Inspector Konrad Seger and Jacob Skarre. Though very different in character, both are thoughtful and excellent officers who work well together. There is no trickery in this book and nothing sensational: it is all very plausible, which may come as a welcome relief. Though it is artfully put together, Black Seconds is no sense too clever. The author’s forte is getting into the minds of her characters, and she does it uncommonly well. Just shy of her 10th birthday, Ida Joner disappears while biking down to the neighborhood store. She never arrived at her destination and no one saw a thing. Volunteers mount days of searches to no avail. When clues do surface, the mystery only deepens. Inspector Konrad Sejer pushes forward with a case that concludes with a page-turning series of interrogations including an autistic loner in his early 50s whose only word is "no". Sejer does not just want to win; he also wants to understand what Just shy of her 10th birthday, Ida Joner disappears while biking down to the neighborhood store. She never arrived at her destination and no one saw a thing. Volunteers mount days of searches to no avail. When clues do surface, the mystery only deepens. Sejer does not just want to win; he also wants to understand what has happened and why. At one point in an interrogation, we are told, "He could attack now, suddenly and unexpectedly, just to watch her stumble for a moment. He did not do so. It had to be possible to defeat her in such a way that she kept her dignity." When Sejer finally gets a full, truthful confession, he knows he is not finished. News spreads, the author writes, "They considered the case closed. Sejer did not."